:Create an original board game. 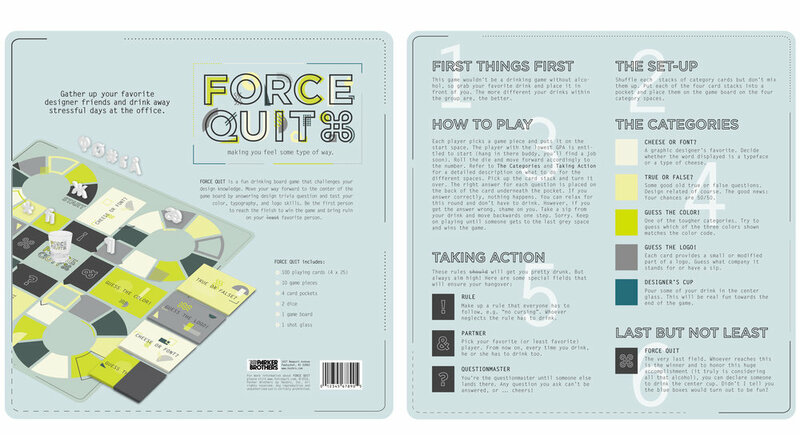 :Created for designers and design fans, Force Quit combines a classic board game with a fun drinking game. :It’s the drinking game you and your designer friends have been waiting for. Combining elements of classic drinking games such as King’s Cup in form of a traditional board game with the moving direction in shape of the Mac Command-Key and beloved design trivia such as “Cheese or Font” or simple True or False questions make the perfect trio for a good laugh and an unforgettable pregame. Roll the die, move along the game board, pick a card and answer/solve the question or drink. Take a stop or two to pour bits of your drink into the Designer’s Cup, be the first to get to the end, and declare a person to drink the wildly mixed shot.